Under the Skin: At Last! 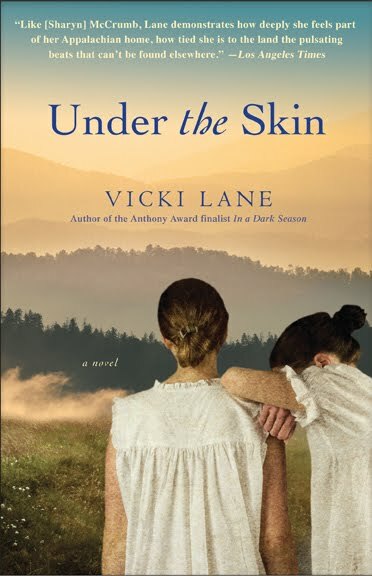 In this haunting tale from the heart of Appalachia, Vicki Lane draws together past and present, good and evil, folklore and secrets, mesmerizing readers with the mysterious bond of true sisterhood—richer than blood, stronger than the passage of time. Elizabeth Goodweather and her city-girl sister, Gloria, couldn’t be more different. Elizabeth lives on a farm in the Great Smoky Mountains. Gloria lives in Florida off an ex-husband’s fortune. Gloria is a beauty; Elizabeth isn’t. Now, to Elizabeth’s intense displeasure, Gloria parks herself at Full Circle Farm, on the run from her latest man, who, she insists, is trying to kill her. Elizabeth thinks this is just another of her sister’s fantasies. Besides, Elizabeth has her wedding to plan—if only she can overcome her fear that the man who already shares her life may not be what he appears to be. At this precarious crossroads, the sisters must turn to each other—or face a lifetime of consequences. I have my e-copy reserved!!!!! Cant wait!!!!! Elizabeth a very happy marriage. Her sister was not a very nice person, was she? I started reading this gripping book and I can't stop!! The cover is beautiful too and it's intriguing! The book is really captivating and wonderfully written, Vicki! I have read two-third of it and I am curious what happens next.Thanks for this great novel! I finished the book and was surprised about the ending. I really thought Glory had been killed. This was a real happy end. You developped Gloria's character from a spoiled womam, who always gets what she wants , into a warm, caring and spontanious person, who is prepared to sacrifice her own life for her sister's. Elizabeth realises that she actually doesn't know her younger sister. This made me think about my younger sister, who is a bit like Glory. I used to think that she was a spoiled brat when she was a child and I was not interested in her actions either. Loved this book. Can't wait for you next one.